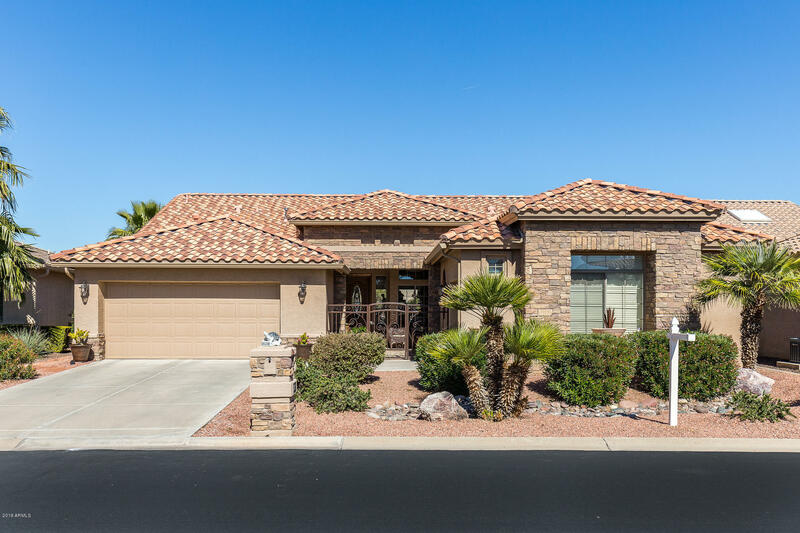 All Sun Lakes homes currently listed for sale in Sun Lakes as of 04/24/2019 are shown below. You can change the search criteria at any time by pressing the 'Change Search' button below. 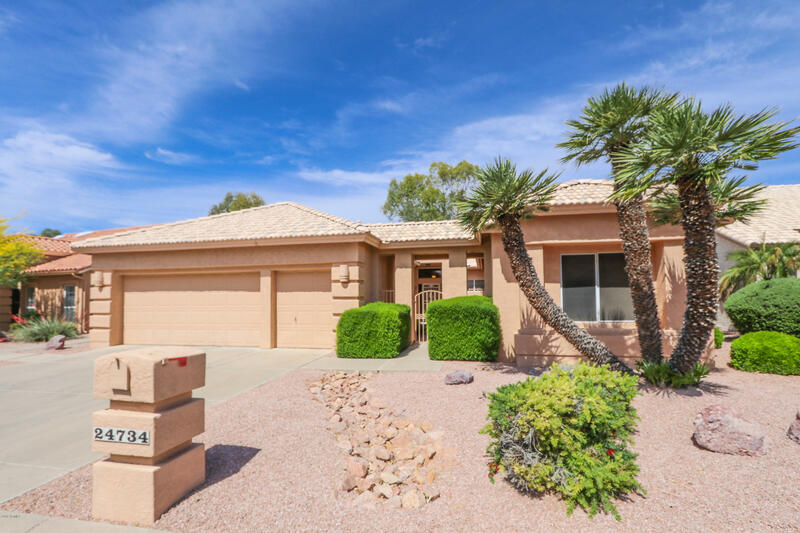 If you have any questions or you would like more information about any Sun Lakes homes for sale or other Sun Lakes real estate, please contact us and one of our knowledgeable Sun Lakes REALTORS® would be pleased to assist you. "Gorgeous Custom Remodeled Home w/Pool on Park Walking Path. 2 Bedrooms & Bath upstairs & Master Bedroom Suite downstairs. Guest 1/2 Bath. Private Den Office. 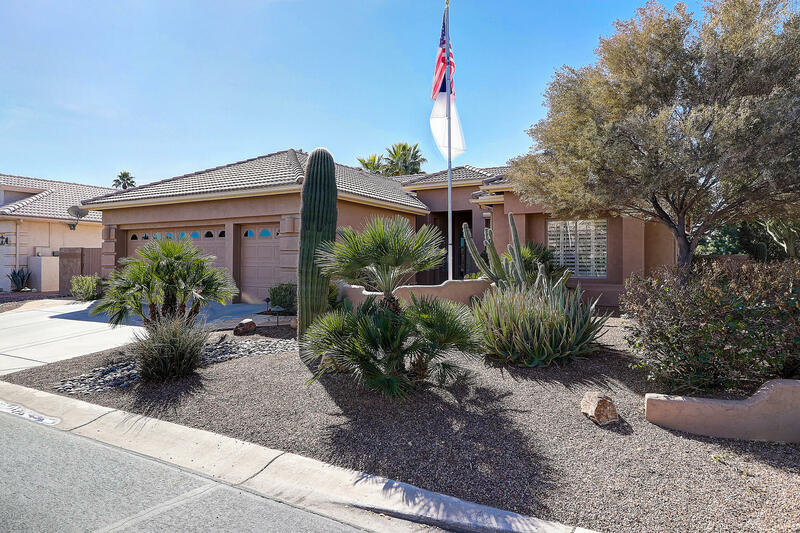 This home has been completely Upgraded & Re-Modeled in most every Room. A one of a kind, so you must see it to appreciate how Gorgeous it is inside & out. It is at the end of a Cul De Sac so you get complete Privacy, also has very nice front Court Yard. It has a Full 3 Car Garage, Full Tile Roof. 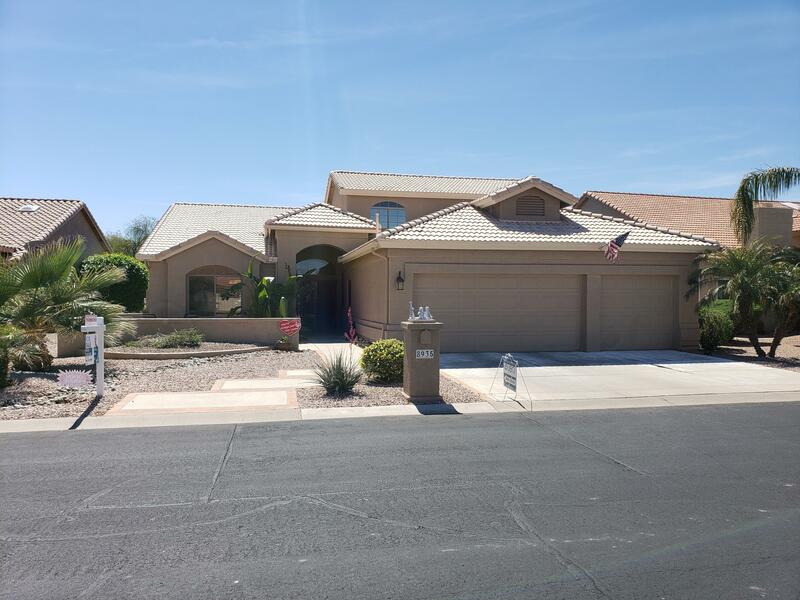 Top of the line in Cabinetry, Appliances, Co"
"Home on Walking Path Huge Corner Lot by the ClubHouse ! Front Courtyard, 2 Story w/2 Bdrms upstairs w/Jack & Jill Bathroom, Master Bedroom Suite Downstairs. (New cabinets & Countertops) Spiral Staircase. new Front Door. Formal Living Rm & Round Formal Dining Room, Family Room & open Flowing Kitchen & Breakfast Area. w/Kitchen Island Private Den/Office. Large Master Bedroom Suite w/Separate Tub & Snail Shower, His & hers Walk in Closets, 2 Sinks, (Custom New Cabinets & Counter Tops), 1/2 Bath of"
"LOCATION, LOCATION, LOCATION !! Golf Course & Lake Views....This beautiful split floor plan sits on a 110K premium lot with many upgrades & is one of the more desirable layouts in the adult community of Oakwood in SunLakes. 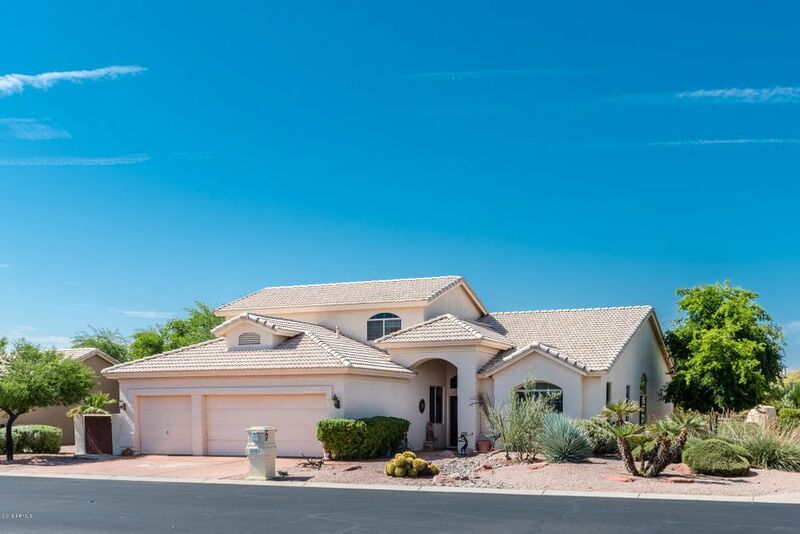 This 3-bedroom 2-bath home with 3 car garage on the golf course has GREAT VIEWS of the lake behind from all the main rooms. There is no golf cart path behind the house. Features include formal dining & living rooms, family room, 3rd bedroom/den/office & bar area. The updated"
"Gorgeous Home on Golf Course/Lake Views. Extended Kitchen /Family Room & Breakfast Area, w/Bay Window. 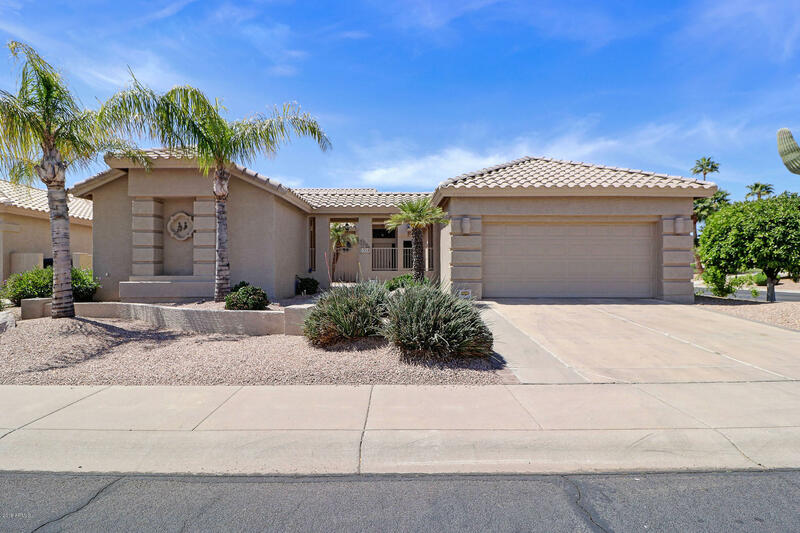 Custom Full Glass Wall Sliding Door to Patio, new Travertine Floors, Vaulted Ceilings, new Kitchen Stainless Steel Appliances, newer Cabinets, Walk in Wet Bar, Mirror Accents, Pot Shelves. Custom Arch Ways in Formal Dining Room, Formal Living Room, w/Wood Burning Fireplace, Plantation Shutters. Private Den/Office w/Custom Hardwood Floors. Extra Large Master Bedroom w/Sitting Area, Lighted Ceili"
"WOW! Situated on one of the most premium lakefront, golf course lots in Oakwood, this beautiful 3 BR, 2.5 BA & den Marbella floorplan is nestled at the end of a quiet culdesac. 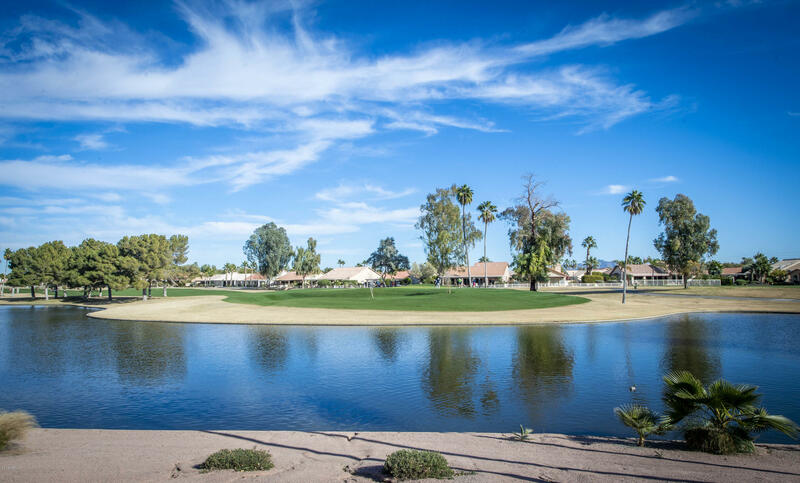 Expansive golf course, lake & mountain views including views of holes 3, 4, 5 & the 6th fairway on the Palms Course. This upgraded home features Gourmet eat-in kitchen with Quartz countertops, large breakfast bar, maple cabinets, wine fridge, glass cooktop, wall ovens & R/O. Kitchen is open to the family room. Single stor"
"Gorgeous Home on Lake Views, Beautiful Pro Pane heated Pool & Spa, Solar for whole house. Formal Living/Dining Rooms w/3 Propane Fireplaces, Family Room, Formal Living Room & Master Bedroom. Kitchen, Breakfast Area, Family Room, Wet Bar, Den/Office w/Library. Plantation Shutters throughout. Custom Tile Floors. New Carpet in Living Room. Kitchen w/Tile Countertops to match Floor Tile, Ice Maker, Wine Cooler, all Appliances. Master Bedroom w/Laminate Floors, Separate Tub & Shower, 2 Sinks, Door to"
"Located in the coveted Oakwood community of Sun Lakes, this golf view Lexia model boasts all of the primary living space on the main floor with 2 guest suites located upstairs for privacy.Upgraded gourmet kitchen with white cabinetry,granite and stainless all open to the large family room.Downstairs office or den w/plantation shutters throughout.Home is light,bright with decorator touches.Views of the backyard oasis,water feature,extended patio and golf course.Extended length 3 car garage w/sto"
"ONE-OF-A-KIND, EXTENDED MONTERA MODEL W/ CASITA ON A CUL-DE-SAC LOT IN THE GATED, ADULT COMMUNITY OF OAKWOOD. BEAUTIFUL COURTYARD leads to the Expanded Great Room that is open to the kitchen w/ tons of cabinets & pantry for storage. Spacious master suite w/ sitting area, huge walk-in closet & sep tub/shower. In addition to the Guest Bedroom, Bath & DEN in the main house, there is a 3rd Bedroom, Full Bath & Walk-In Closet in the CASITA. Extra Storage in the Large Laundry Room w/ 1/4 Bath & in the"
"Don't miss this entertainer's dream home in this desirable active adult community with residents age 40+. 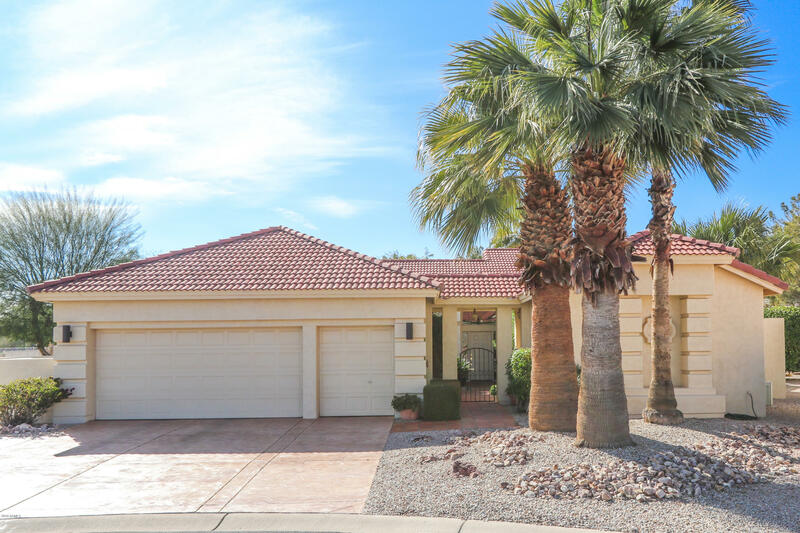 Enchanting, lovely, upscale 4 bedroom/3 bathroom and den, 2 story Marbella home with diagonal tile throughout the living areas and upgraded carpet in the bedrooms. The spacious living area can be used for dining and living space, plus the family room is conveniently located off the kitchen. 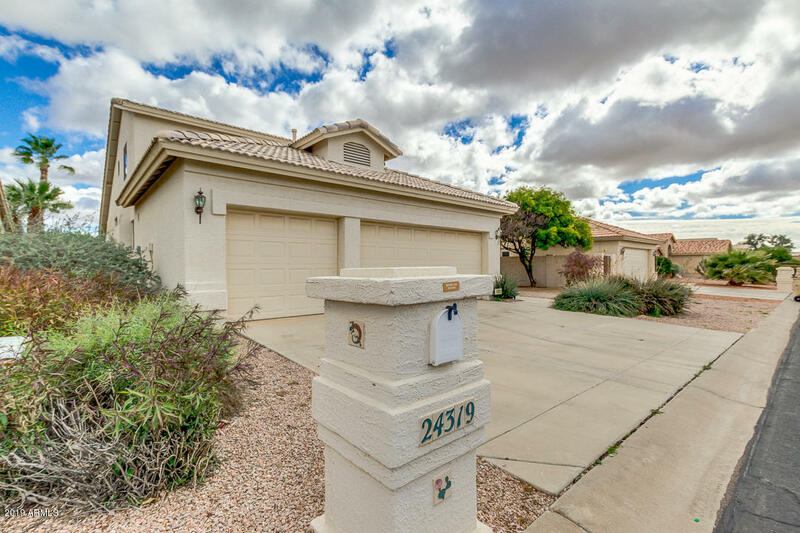 You will love the kitchen with upgraded cabinets, granite countertops with tiled backsplash, stainless"
"GOLF COURSE LOT home with 4 bedrooms and 3 full baths. 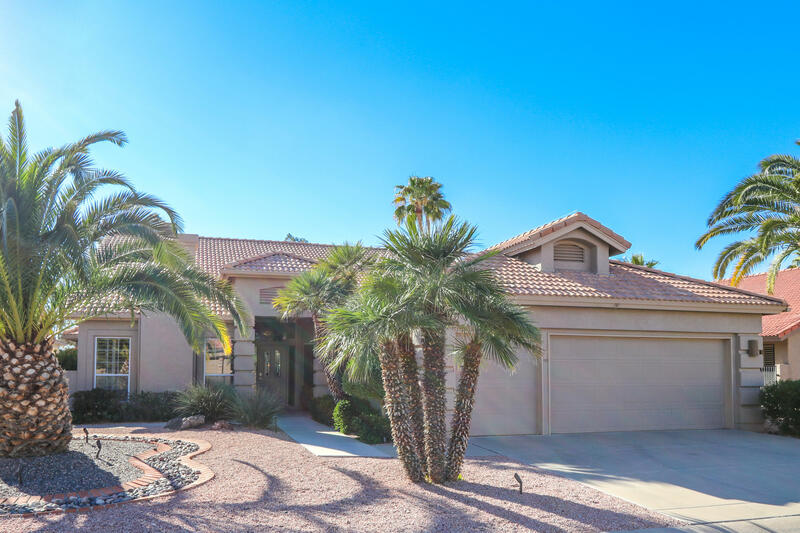 Situated on a N/S facing lot on the Lakes #4 course, this Marbella offers main floor living with the master suite and one guest bedroom on the main level and two guest bedrooms and bath on the 2nd level. Great curb appeal with pavers on the walkway and spacious courtyard. Separate FAMILY ROOM open to an entertainers kitchen with granite counters, updated cabinets, tile back splash, SS appliances and wine fridge. Formal living and dining in s"
"SELLER MOTIVATED. AGGRESSIVE PRICE REDUCTION. DON'T MISS THE OPPORTUNITY TO OWN THIS EXQUISITELY appointed single story Marbella with 2 bedrooms, 2.5 baths, separate office/den and many custom upgrades. Custom venetian plaster wall in formal dining room and cozy fireplace in formal living room. Spacious kitchen with staggered maple cabinets (sliders), newer appliances, newer granite and backsplash and open to the family room with custom built-in niche. 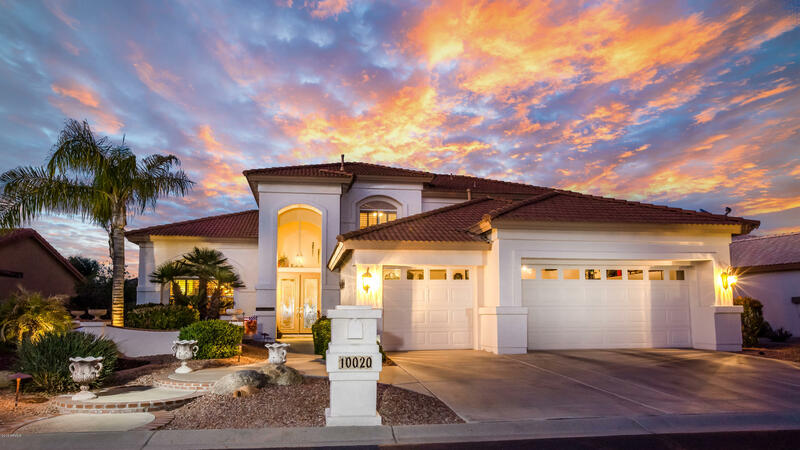 French doors usher you to your private reso"
"Stunning home located on the Golf Course in the upscale area of Sun Lakes. This gem of a home has it all! 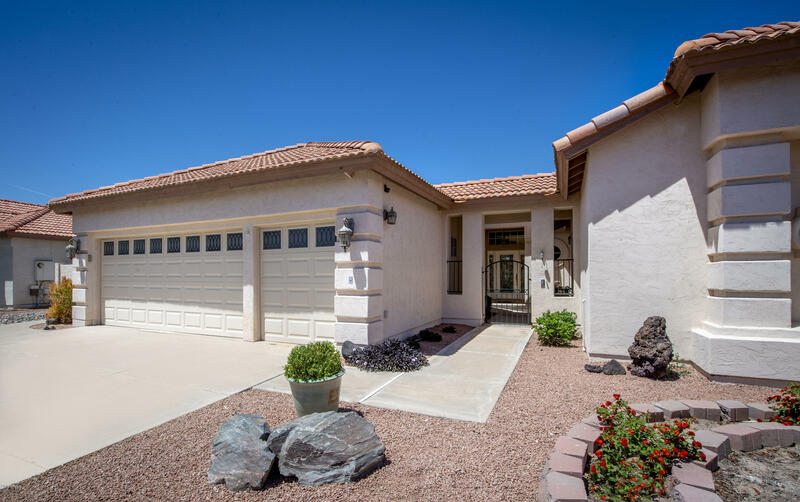 Situated on a N/S facing lot, you have easy access through your keyless garage or front door! A warm welcome into the bright and cheerful open concept living and dining room with ceiling fans throughout. Impeccable gourmet kitchen perfect for the inspired in-home chef, high-end upgrades featuring maple cabinets, oversized Kitchen Island with under-mount sink, Cutting edge gas cooktop stove"
"Come see this meticulously maintained Trova model in Sun Lakes community of Oakwood. Picture yourself relaxing on the extended patio with drop-down roller shades, swimming in the gorgeous Pebble-tec pool with soothing water feature. The kitchen has updated counters and stainless steel appliances that will make you feel like a famous chef. 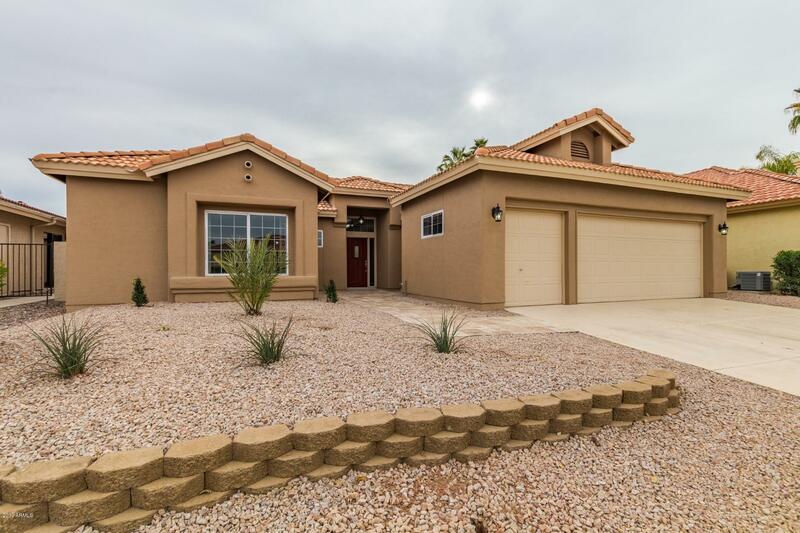 There is a built in R/O water dispenser on the kitchen island and a soft-water loop for the whole house in the garage next to the full-length built in cabinets"
"Absolutely gorgeous home in Sun Lakes Oakwood. Light, bright and airy floor plan. Modern, updated kitchen with beautiful granite counter tops and stainless appliances. Move in ready, shows like a model home. Welcoming front patio courtyard invites you into this stunning home. Master bedroom and guest bedroom downstairs with a den/office, and two additional bedrooms upstairs. Huge master suite with bay window slider to patio. Large master bath features jetted tub and his and hers closets. Bac"
"Your Buyers will Love this Beautiful Home at a GREAT Value. It is the most popular Marbella Plan with the Master Downstairs. The Formal, Private, Dining and Living Room are great for entertaining. The Master has his and hers walk in closets. Granite countertops highlight a beautiful kitchen with upgraded Stainless steel appliances. Upgraded Washer and Gas Dryer are featured in private laundry room with cabinets galore. 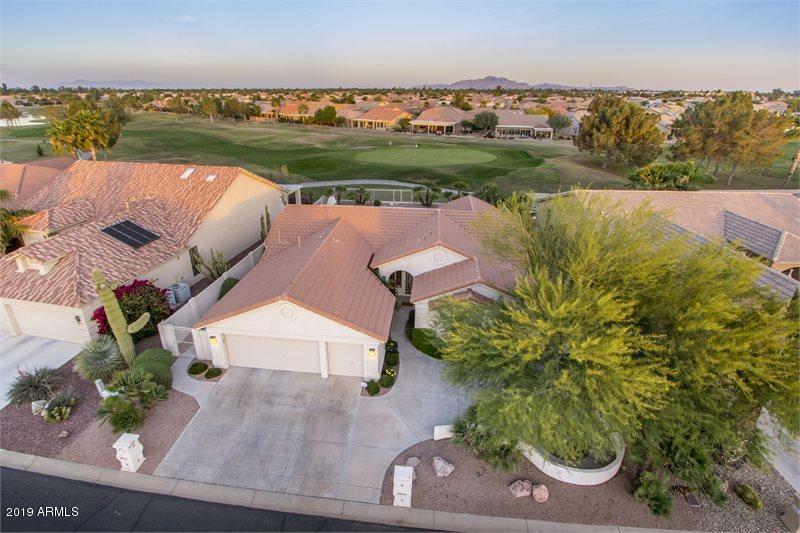 Custom covered patio with Custom outdoor kitchen wired for satellite or"
"GORGEOUS Borgata model w/ PHENOMENAL GOLF COURSE, WATER & MOUNTAIN VIEWS close to the Club House in GATED, ADULT COMMUNITY of Palo Verde! So many upgrades throughout this home! It is beautifully appointed w/ wood-look tile, designer lighting, skylights, plantation shutters, KINETICO water system, newer HVAC & 2-car plus GOLF CART GARAGE w/ EPOXY FLOORS & tons of storage. The OPEN Kitchen has STAINLESS APPLIANCES, GRANITE, MAPLE CABINETS & WALK-IN PANTRY. MASSIVE Master Suite w/ REMODELED BATH & "
"Welcome home! 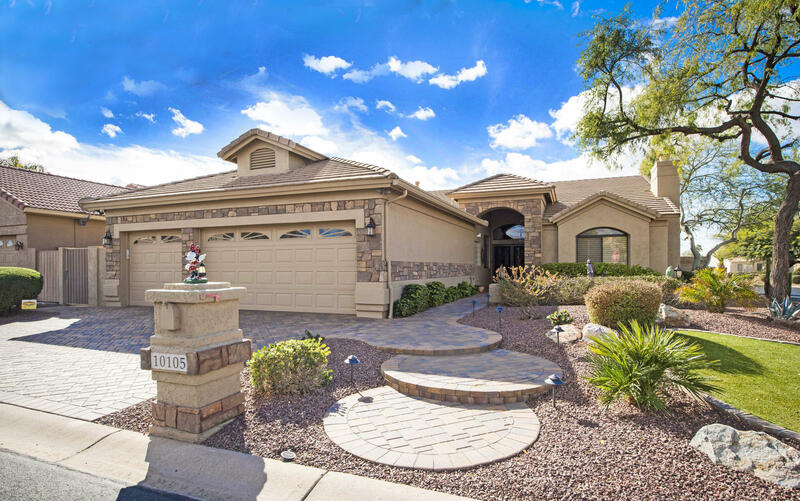 Nestled in the highly desirable Adult Community, Palo Verde of Sun Lakes. 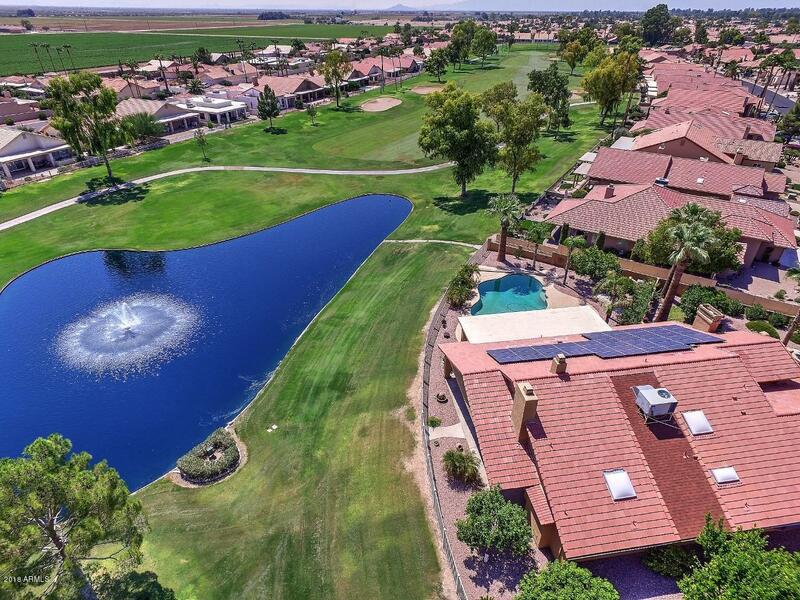 This Golf Course Home offers an open floor plan with endless Golf Course Views. Home is a complete update with many custom features. 2 Bedrooms+Den, 2.5 Bathrooms. Vaulted ceilings, Stack Stone floor to ceiling Fireplace, new wood plank porcelain tile flooring t/o and new carpets in the bedrooms. 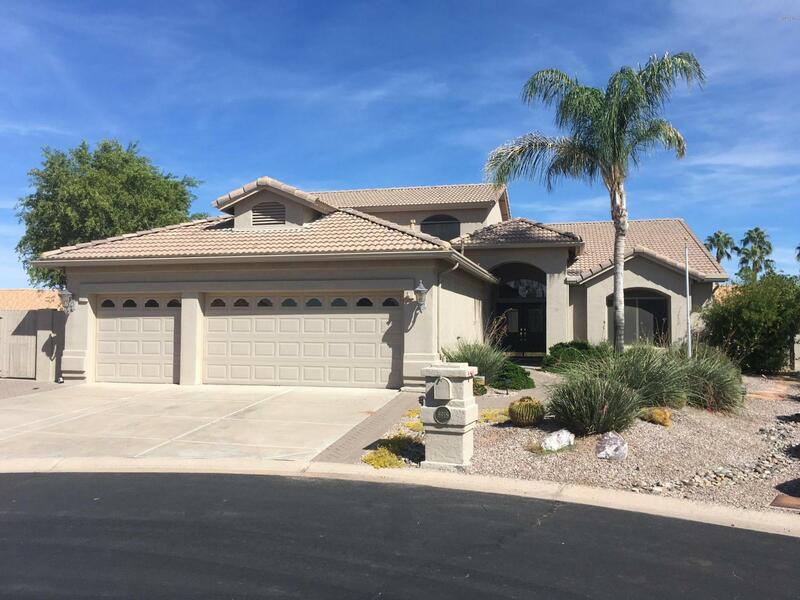 Rich wood cabinetry, granite countertops, new stainless steel appliances, walk in pantry, and a large island creat"
"Your dream home oasis is waiting! Exceptional 2 bed with den in Sunlake golf course. 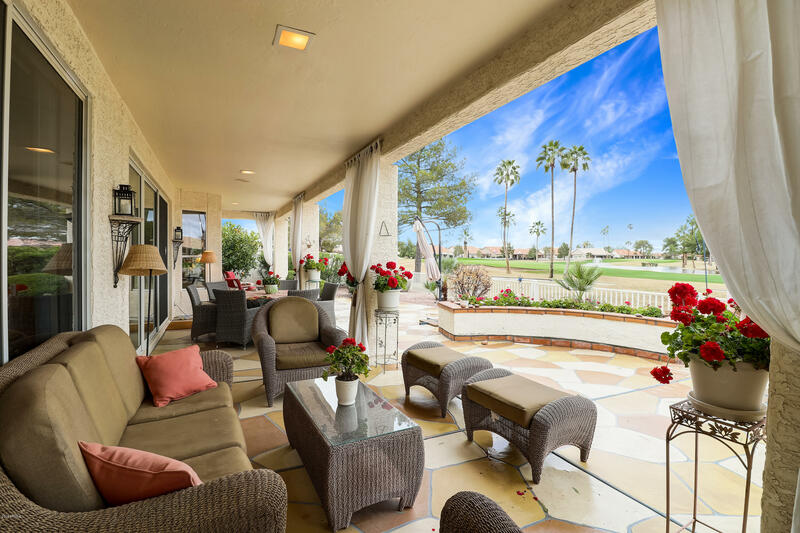 Perfectly positioned on the 8th tee, Neutral decor and upgrades from entry courtyard to pool area.Tile, shutters, fans and corian counters throughout. Options include built-in wine fridge and trash compactor. A flexible plan with formal living/dining rm and family rm. Master has bay window, shower seat and lg walk-in closet. Guest room is ext 4 ft with walk in closet. 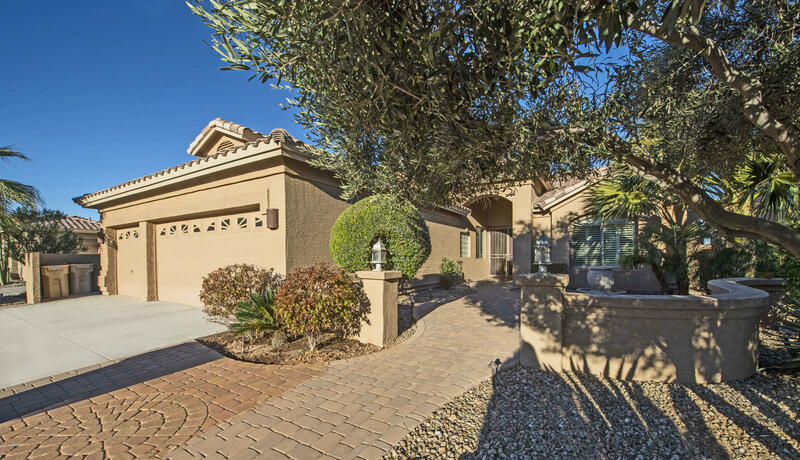 Watch moonrises by heated pool and large"
"Gorgeous Home on Corner Lot, Gated Courtyard w/Flagstone Walk Way. 3 Bedroom, 2 Bath plus Office & Formal Dining Room, Large Open Kitchen w/Island, Oak Cabinets, Flat top Stove, Corian Countertops, Plantation Shutters, small Desk, Built in Micro Wave Oven, all Appliances, Tile floors in all the right places. 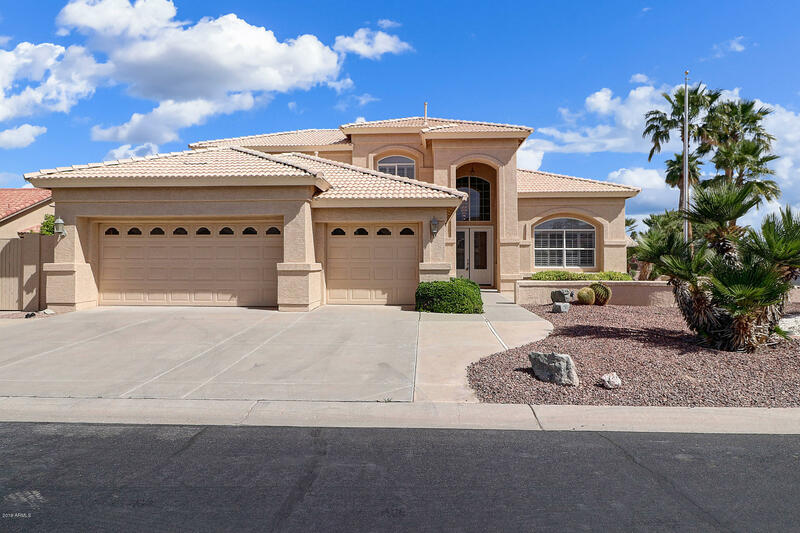 Vaulted Ceilings throughout, Plantation Shutters throughout, Large open Great Room w/Large Glass Sliding Doors going out of the Sun Room/Arizona Room, Laminated Floors, 4 sets of Custom Sl"
"Gorgeous Home on Golf Course. 2 Bedroom/2 Bath. Separate Guest House. Private Extended Court Yard w/ Pavers. 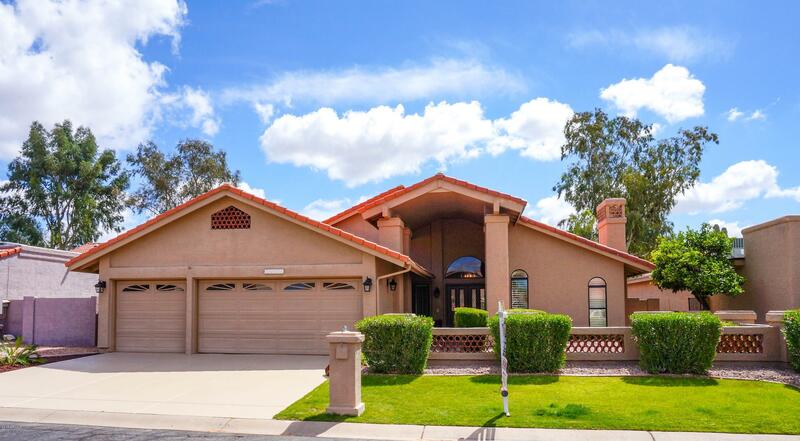 Large Open Floor Plan, Formal Living/Family Room, Large Breakfast Area w/Custom Counter/Cabinet, Custom Carpet. Vaulted Ceilings. Ceiling Fans. Private Formal Dining Room. Large Open Kitchen w/ Island, all Appliances, Flat Top Stove, Corian Counter Tops, Light Cabinets w/Pull Out Drawers, Desk, Tile Floors in all the right places. Inside Laundry w/Washer & Dryer, Cabinets. Large Open "
"Priced BELOW recent appraised value! Gorgeous park like setting with back and side yards with mature landscaping and water fountain. This popular Barcelona floorplan features a casita that adjoins the main house with a separate entrance and bonus room kitchenette. Perfect for a home office, mother-in-law quarters, or a craft/hobby room. Elegant bamboo flooring in the main living areas with cork flooring in the Casita. The master suite is rspacious with patio access and huge walk in closet. 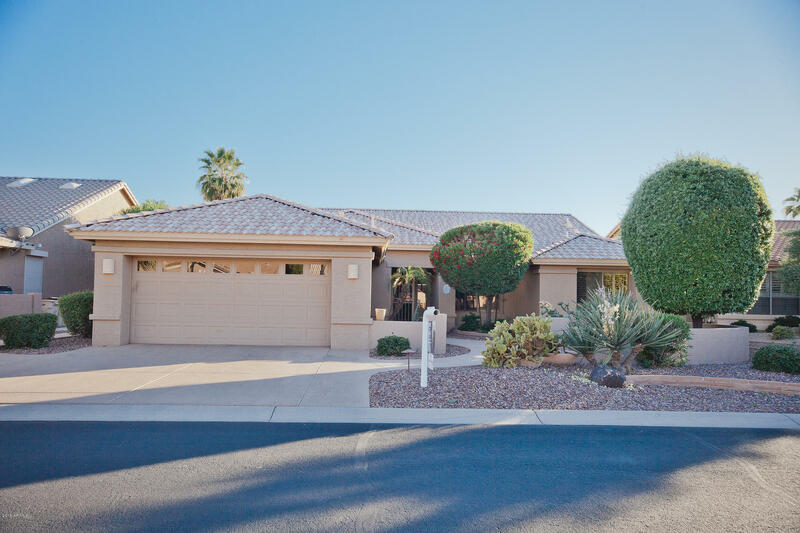 Mast"
"Quality remodeled home in the Gated Active Adult Community of Cottonwood Palo Verde! 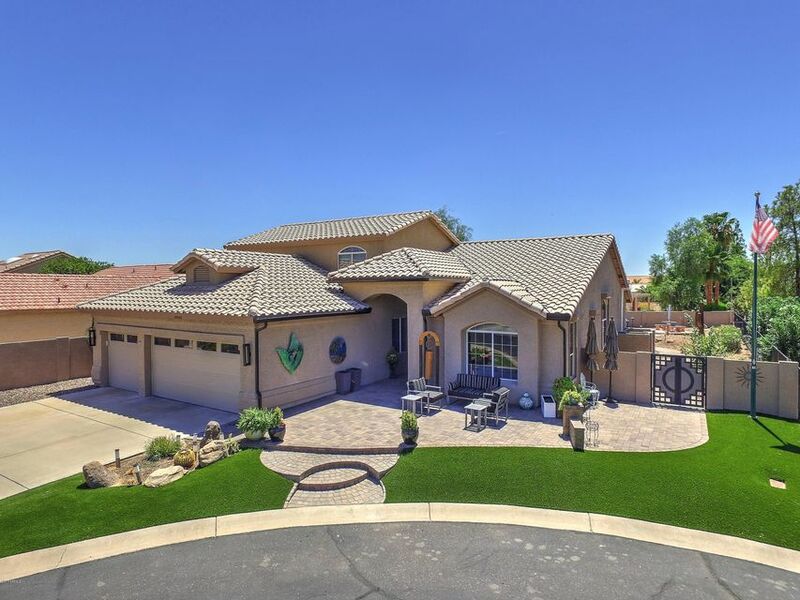 Located on the Golf Course w/ serene water & mountain views!Greeted by an exquisite floor to ceiling stacked stone fireplace, vaulted ceilings, fresh interior paint, brand new flooring, cozy sitting area w/ built in wet bar off kitchen nook, entertaining formal dining space, additional outside living space in the cool screened in AZ room**East facing backyard!3 car garage, over 2500 SF of interior living space! " "A beautiful Galleria awaits you in the adult community of Oakwood! This home is over 3100 sq ft on an extra large lot that features a pool, hot tub, fireplace and built in grill on walking path. Large master suite on main level and 2 bedrooms and bath on 2nd floor. Home also features a den/office area, formal living room and plenty of storage. 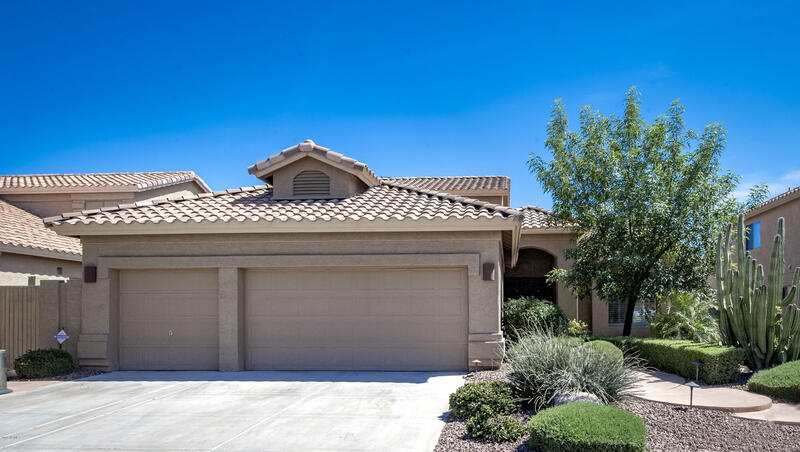 This is a wonderful opportunity to own and enjoy the great life in Sun Lakes."